Magic Duels: Origins is the latest digital iteration of Wizards of the Coast's legendary card battling game Magic the Gathering. The game is currently available for iOS, Xbox One and PC via Steam with a Playstation 4 version coming soon. 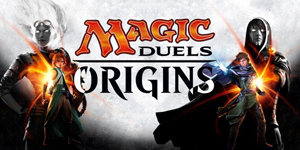 Magic Duels: Origins is the successor to the previous "Duels of the Planeswalkers" series which appeared in yearly installments on multiple platforms. Unlike the DOTPW series, Origins is free to play and allows much more freedom in deck building. Everything in Origins will be available for purchase with in-game currency that can either be earned by playing or bought with money. In addition (according to the video below) the developers have committed to continuously updating and supporting this game as opposed to releasing an entirely new game annually as they have in the past. Magic Duels: Origins seems to be following Hearthstone's monitization model rather closely, mimicking it's daily quest and grind for packs systems. Origins brings much more freedom to the deck builder (a common criticism of games from the DOTPW series) as well as bringing a host of single and multi player options into the game, including the return of the fan favorite 2-on-2 "Two Headed Giant" mode. The system requirements for the iOS version are rather steep, supporting only the newest of devices. I just recently started playing the Steam version and my initial impressions are positive. The video below provides a first look into how the game is structured as well as providing some insight from the developers into future plans for the title. 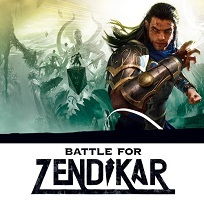 The Battle for Zendikar update for the Steam version of Magic Duels has been released. The expansion includes over 150 unique new cards in the form of new booster packs available for in game gold from the store as well as a new starter box that is free with the first booster purchased from the new set. The Battle for Zendikar expansion also includes new single player story campaign content, new daily skill quests and a new offline mode. More information about the Magic Duels official digital implementation of Magic: The Gathering can be found in the original post detailing the game here. The expansion is still being worked on for the iOS and Xbox One versions of Magic Duels and are scheduled to be released soon. The release of the Playstation 4 version of Magic Duels has been delayed until 2016. The full list of patch notes and fixes for the Steam version of the Battle for Zendikar update for Magic Duels is here. After some delay the Battle for Zendikar update/expansion for the iOS and Xbox One versions of Magic Duels has been released, bringing them up to date with the PC version on Steam. The development team has stated that the delay in the release of the expansion was necessary to ensure that issues with the game on these two platforms could be ironed out, including the problematic online matchmaking and to ensure a quality release. In addition to the new cards, play modes and user interface improvements in the update several tweaks and bug fixes have been implemented and are listed individually for the two platforms in This Facebook post. More information about the Magic Duels game can be found in the original post. For details on what is contained in the Battle for Zendikar update/expansion see this post. The release of the Playstation 4 version of Magic Duels has been delayed until 2016. The Oath of the Gatewatch expansion for Magic Duels has been delayed. While originally intended to be released around the seventh of January in line with the release for the physical game, it has been delayed until April at which time it will be released in conjunction with the following expansion entitled "Shadows over Innistrad". With the Shadows over Innistrad update in April the developers intend to be back on track to delivering regular content updates for Magic Duels aligned with Magic's paper set releases. A link to the official announcement can be found here. More information about the Magic Duels digital implementation of Magic the Gathering can be found in the original post here.